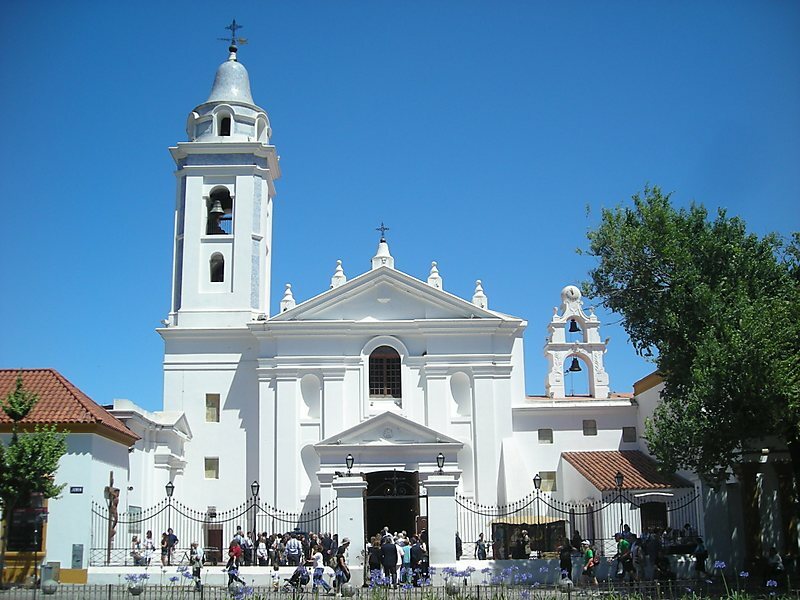 White Basílica Nuestra Señora del Pilar, the key structure of the former Franciscan convent in Recoleta, belongs among the most beautiful examples of colonial Baroque architecture in Argentina. 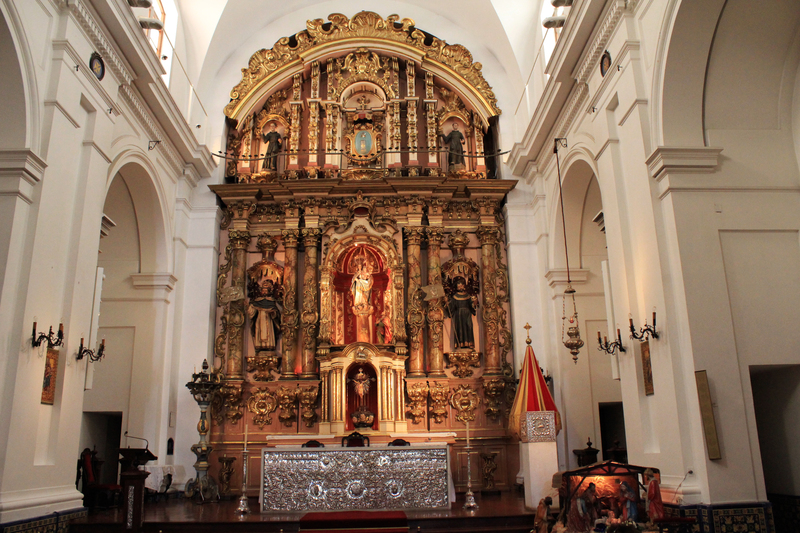 The church was built together with convent of reformed Fransciscan order (so called Recollets or Recoletos) thanks to activity and sponsosrhip of Captain Pedro Bustinza and merchant Juan de Narbonne. 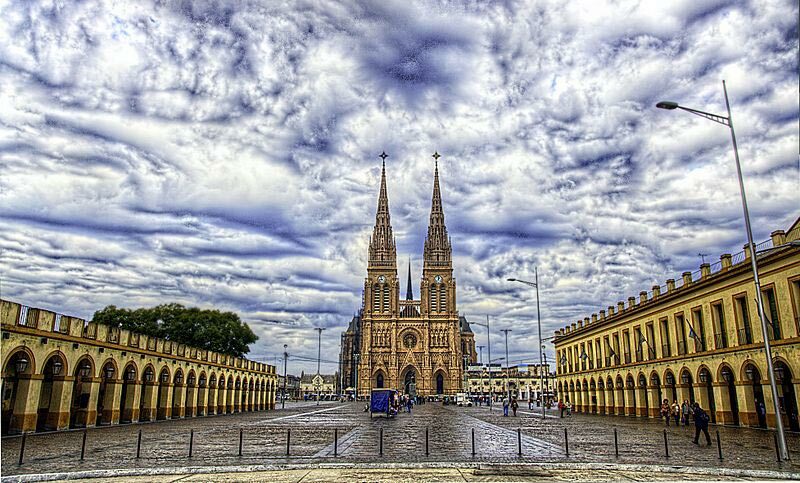 The church was dedicated to Our Lady of the Pillar in remembrance and tribute to Narbonne’ hometown, Zaragoza, where is famous basilica bearing the same name. 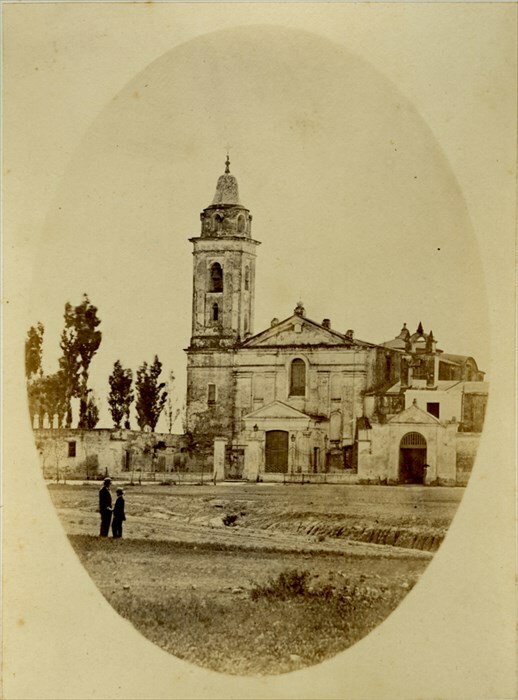 The convent buldings were built the first, between 1715-1721, the church itself with 30 m high main belfry – work of architects Andrés Blanqui and Bautista Prímoli – was finished in 1732. 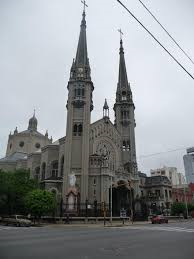 The Franciscan bishop of Asuncion (Paraguay) consecrated the church on May 30, 1734. 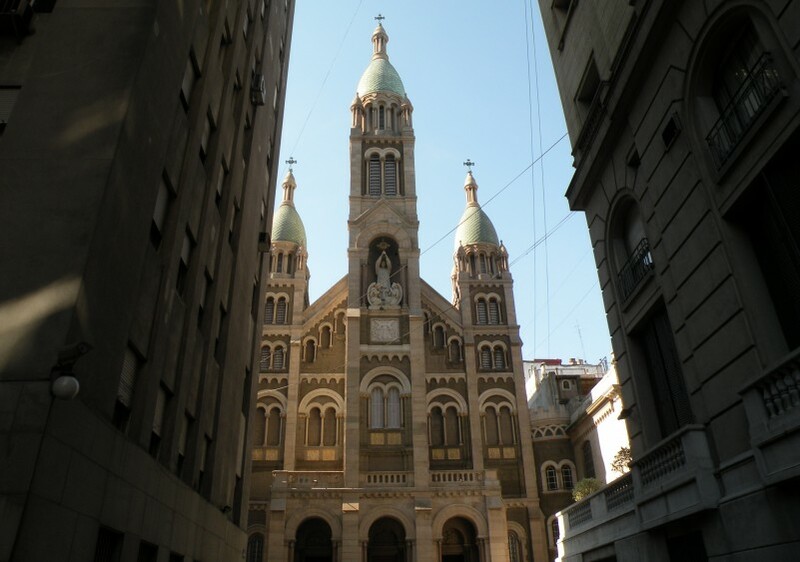 Built in Neogothic style, it is dedicated to Our Lady of Luján, patron saint of Argentina. Many people mistake this temple for a cathedral. 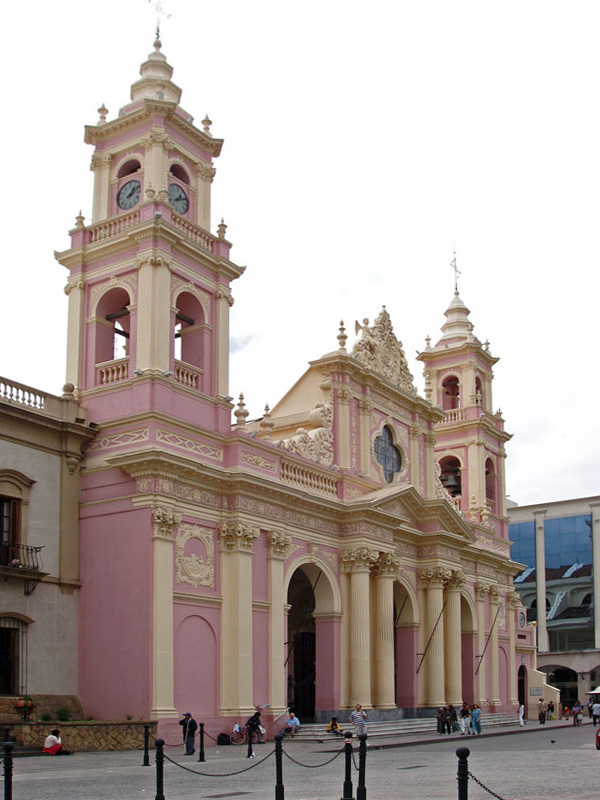 Actually, it is part of the Roman Catholic Archdiocese of Mercedes-Luján, whose see is located at the Cathedral Basilica of Mercedes-Luján in the neighboring city of Mercedes. 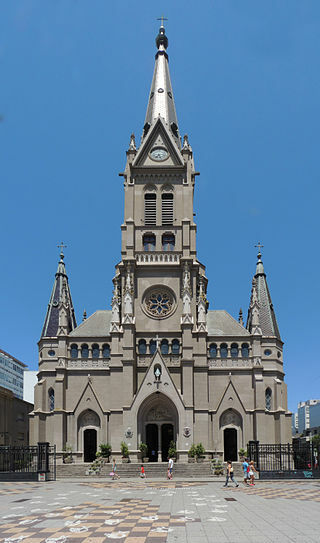 Built in Neogothic style, it is dedicated to St. Peter the Apostle and St. Cecilia. Built in 1904 in Gothic Revival style. It contains the remains of Don Saturnino Unzué and Doña Inés Unzué Dorrego, its main benefactors. On 15 April 2010, the building was declared a National Historic Landmark under Decree 492/2010. 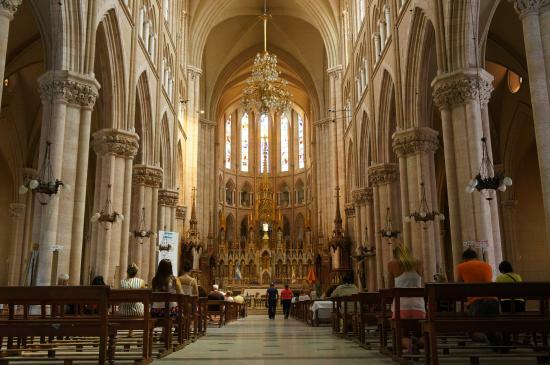 This cathedral is dedicated to Our Lady of Mercy. 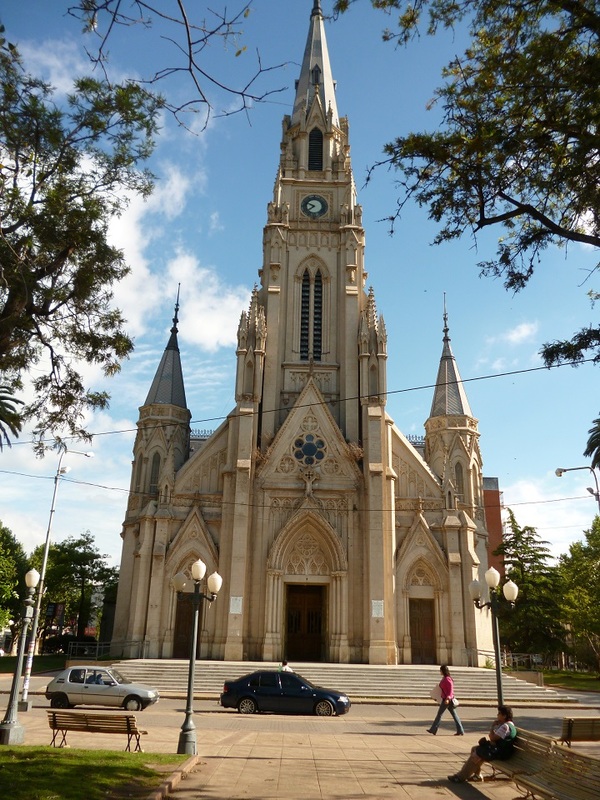 It should not be confused with the Basilica of Our Lady of Luján, a much bigger and famous temple which is located in the same diocese. 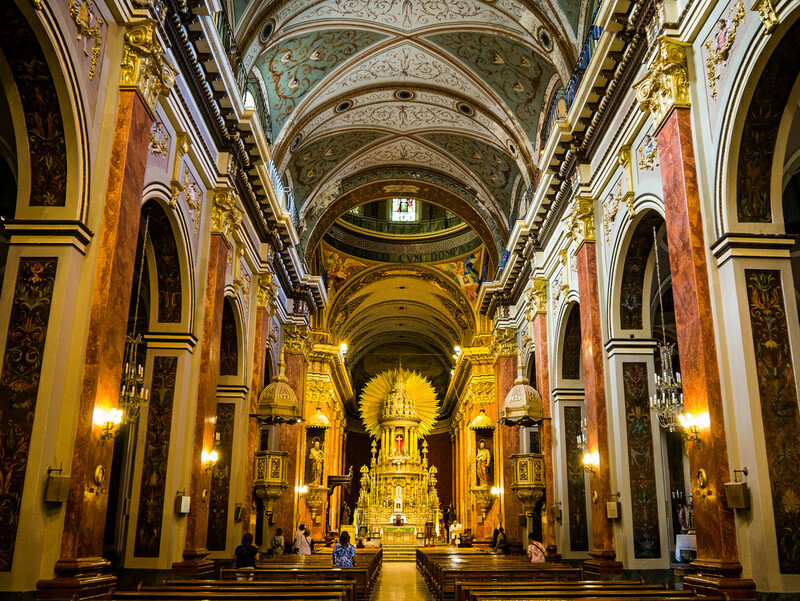 Marking the approach into San Telmo, this 18th-century Dominican church and monastery has a long and colorful history. On the left tower you’ll see replicas of cannons launched against British troops holed up here during the invasion of 1807; the basilica displays flags that were captured from the British. 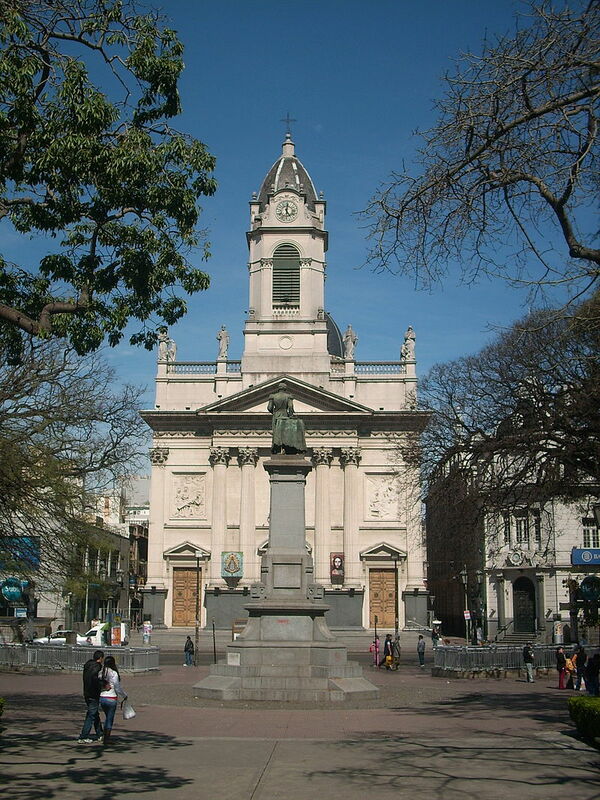 In front of the church is the mausoleum of General Belgrano, the independence hero best known as the creator of the Argentinian flag. 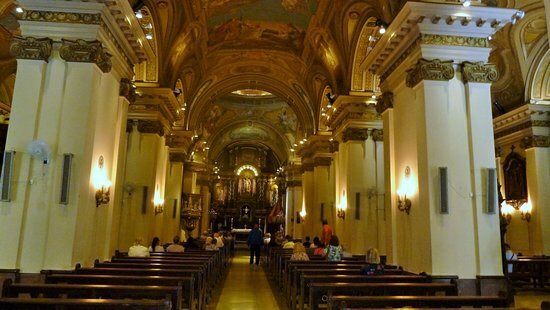 The Basilica of Nuestra Señora del Rosario has three naves, the central one has a barrel vault and a dome over the crossing. 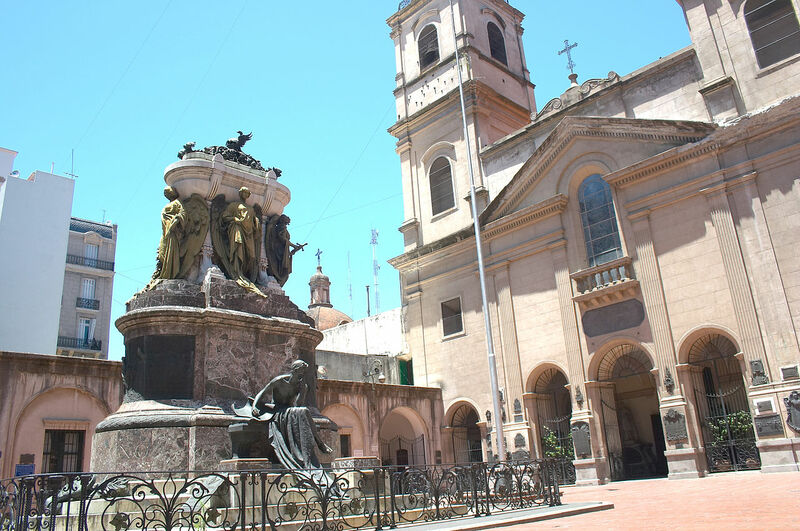 Highlights the Spanish colonial style bars in the atrium, starring Manuel Belgrano’s mausoleum, also remaining at the entrance to the church, which is composed of three arches leading to the narthex trellises. On each side, two doors, one on each tower, take to the aisles. Behind the altar of the aisle that the flags of the British battalions shown. 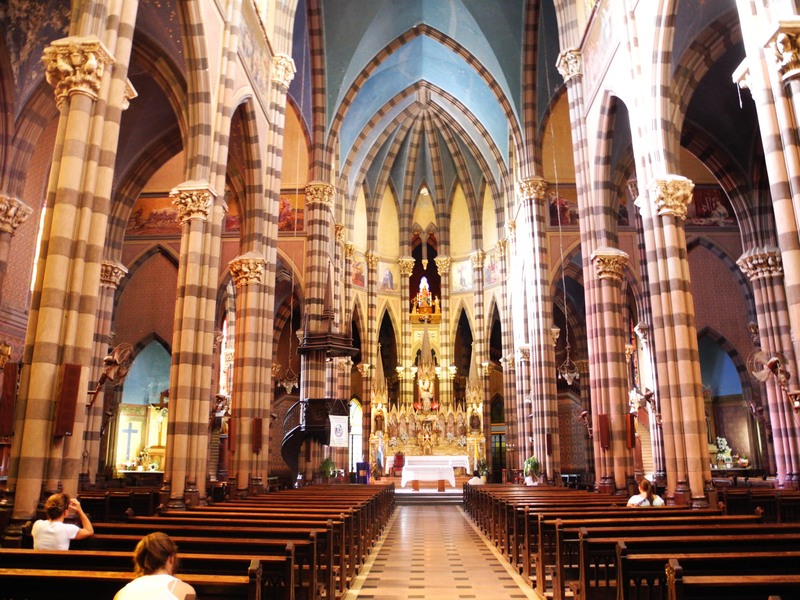 On the inside, its columns are decorated with reliefs, and the nave was clad in carved marble. The existing main altar was made after the fire the old, burned in 1955 The roofs of the vaults are in an advanced state of deterioration, and prevent accidents plaster detachments product and material has been placed few meters down a network of these. The confessionals were made of marble, with carved wooden doors and alternate inscriptions over their doors, “Noli Amplius peccare” and “Give iniquitatem meam”. “Verbum Dei Praedica” appears on access to the pulpit. 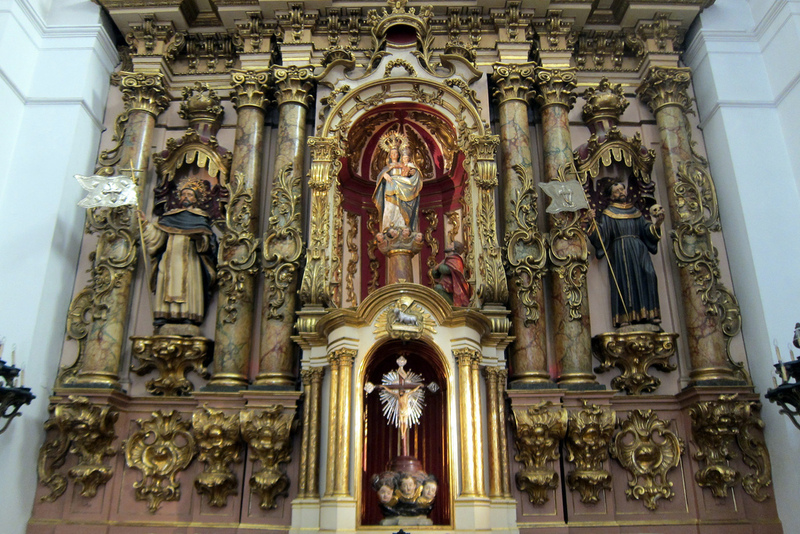 The basilica has many chapels with images of saints such as St. Martin de Porres, and several plaques in memory of heroes who participated in the Defense and Reconquista during the British invasions of important members of the order and of famous people who are buried in it. For example, Fray José del Rosario Zemborain, Nevares Trespalacios Alejo, José Matías Zapiola, Luis Maria Saavedra and his wife, among others. Several plates recall the procession held in 1922, including one that replicates a photograph of the crowd coming from the Plaza de Mayo in front of the Cathedral. A particular plate contains the text of the decree signed on 10 October 1926 by President Marcelo Torcuato de Alvear, allowing display the flag of War of Argentina with this image of Our Lady of the Rosary. On a vane on the right tower is a figure of a dog as the Dominicans are named from the Latin Domini canis (dogs or guardians of the Lord). On the left is the traditional vane silhouette of a gallo. The building had an organ built in France by the house Mutin Cavaillé-Coll, which was destroyed in 1955 during the aforementioned burning churches. 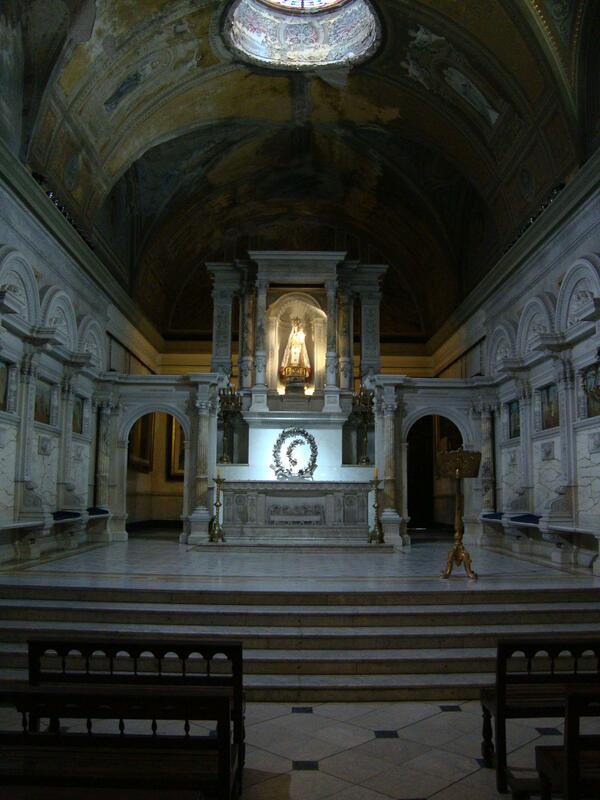 Years later, another body of German origin was located where the altar was installed, but it was not completely finished, and is estimated to run a 60% lack thereof. 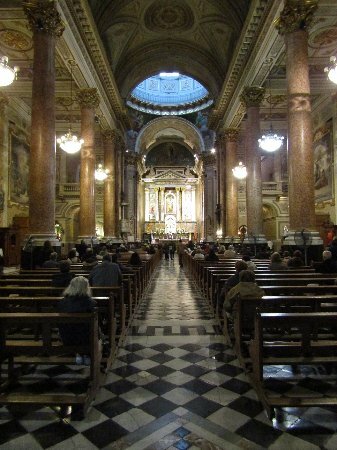 Today, I still run at maximum capacity, rarely reaches to fill the spacious nave with its volume, but nevertheless presents an architectural contrast gives counterpoint to colonial style building with a modern instrument of the 1960s, which is what first thing a visitor sees when entering the temple. 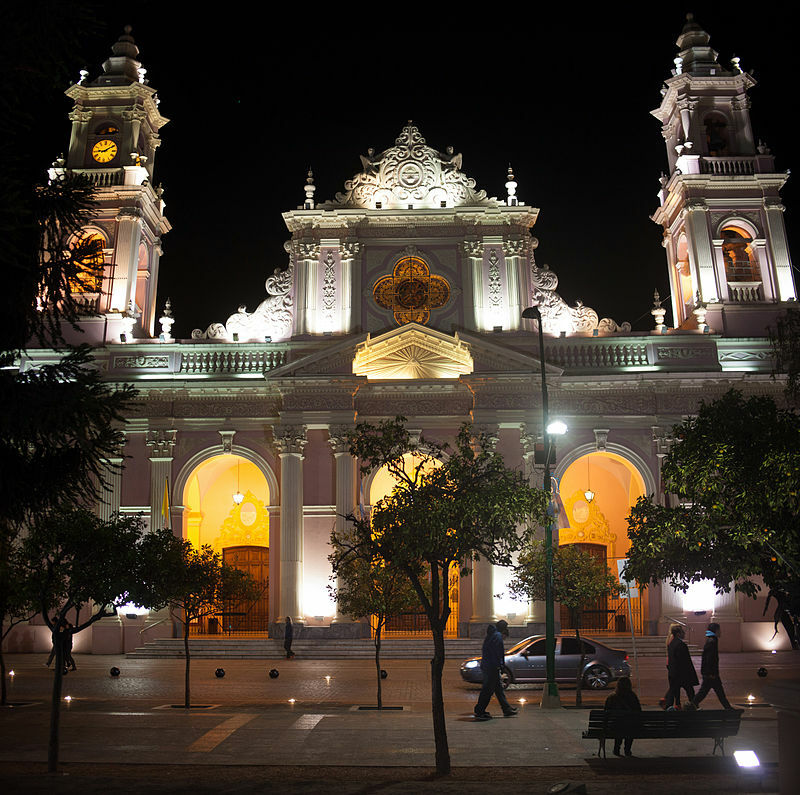 The Basilica was donated to the Congregation of the Sacramental Fathers Maria Lina de las Mercedes Castellanos de la Iglesia. Daughter of Aarón Castellanos Velazco, one of the pioneers of the Santa Fe agrarian colonization and the promotion of European immigration in Argentina. She was the wife of Nicolás Hugo de Anchorena Arana. Grandson of Juan Esteban Anchorena, founder of the Argentine dynasty that arrived from Spain in 1751. During his residence in Paris, Mercedes de Anchorena went to mass at the Corpus Christi chapel, at 9 Bis on Rue Moulin Joly. 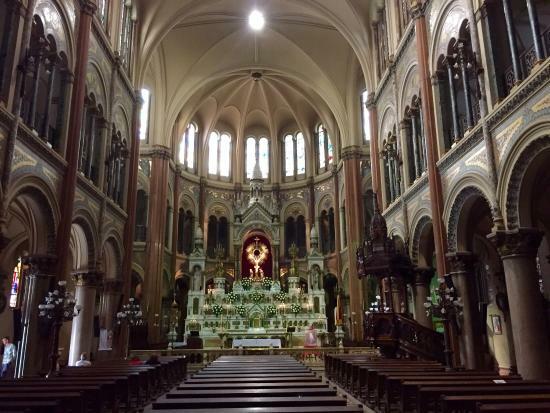 Because the Blessed Sacrament was adored there. Then he spoke with the sacramentine parents. 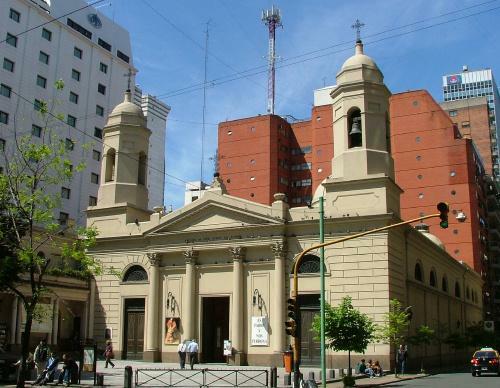 He told them of his desire to build a church in Buenos Aires to worship the Blessed Sacrament. Finally the fundamental stone was placed in 1908, being consecrated in 1916 by the Archbishop of Buenos Aires, Mariano Antonio Espinosa. 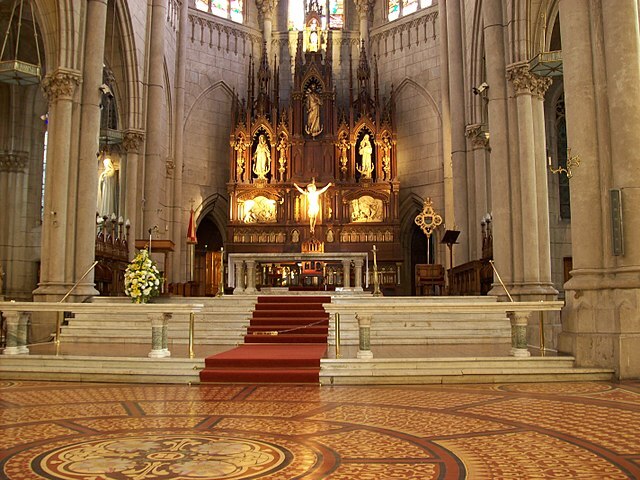 That same year erected in Minor Basilica by Pope Benedict XV. It was designed by the architecture studio Alfred Coulomb and Louis Pierre Léopard Chauvet. Those plans were modified. The construction the Salesian architect Ernesto Vespignani. It has five towers, three that can be seen in its central façade. In the center of this front is a sculpture of Blessed Julián Pedro Eymard, founder of the Congregation of the Blessed Sacrament.